Lord Snowdon led a life extraordinary by any standards. Born plain Antony Armstrong Jones, the son of a successful Welsh barrister and the beautiful, half-Jewish daughter of a banking family that had originated in Germany, he was a well known photographer by the age of twenty-five; five years later he married the Queen’s sister, Princess Margaret. For this book, he spoke to Anne de Courcy with a freedom that he has never shown before or since, as did the Princess’s ladies-in-waiting, their household staff and most of their intimates. The result is a riveting portrait not only of the slow disintegration of a passionate marriage but of a lifestyle. Most of Snowdon’s childhood was spent ricocheting between his father and his different houses – and wives – and his glamorous, socially ambitious mother, chatelaine of Birr Castle, who had married the Earl of Rosse as her second husband. His photographic life began as assistant to the society portrait photographer Baron a milieu then unheard of for someone of his social background. Tony was undaunted by what the world thought, even when told to go to the tradesmen’s entrance by Colin Tennant (later Lord Glenconner) with whom he had been at Eton, when photographing Tennant’s wedding to Lady Anne Coke. When invited by the Queen – who had seen one of his photographs in a friend’s house – to photograph Prince Charles and Princess Anne, he put the royal children by the bank of a stream running through the Buckingham Palace grounds, with their parents looking down on them from the bridge above, in a picture that became iconic for its naturalism n an era of posed formal portraits. His name was made. Within five years, after a slew of romances and affairs, he had married Princess Margaret. His career continued, with design triumphs and stunning photo-journalism; his marriage withered, in part owing to his numerous affairs. This book tells the story of a full, scandalous and brilliant life. 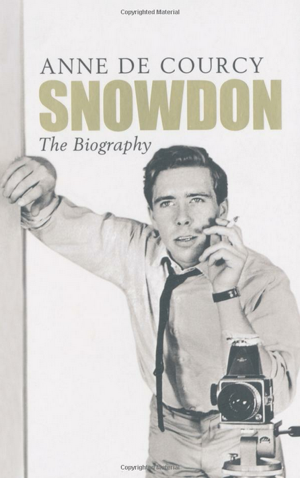 Snowdon’s full co-operation with such a candid biography has allowed a commendably unvarnished portrait of a charismatic, contradictory individual to emerge. The amorous Snowdon was remarkably helpful for this life; the result is jaw-droppingly revealing.